Nitrogen (N) gaseous losses have environmental and economic implications. Ammonia (NH3) volatilization and nitrous oxide (N2O) emissions from a volcanic soil were concurrently quantified using intact lysimeters, after application of the equivalent to 100 kg N ha-1 with and without urease (NBPT) and nitrification (DCD) inhibitor: Urea, Urea+NBPT, Urea+DCD, Dairy slurry and Dairy slurry+DCD. A control treatment (-N) was also included. Treatments were distributed on a randomized block design and evaluated during 28 days. Ammonia was analyzed for NH4 by colorimetry, while N2O was estimated by gas chromatography. Total emissions were estimated by addition of daily fluxes, and results were analyzed by ANOVA. Ammonia was the main N loss, with 35 to 43% and 5% to 16% of the total N applied in Urea and Dairy slurry (P<0.01), respectively, with and without inhibitors (P>0.05). The use of DCD reduced N2O emissions by 44 and 8% in the same treatments, respectively (P<0.05). Results suggest that DCD has a potential as a mitigation option in grassland volcanic soils reducing N2O losses. The use of NBPT did not reduce NH3 losses and N2O emissions when applied with urea. Concurrent N gasses losses from soil showed that indirect N2O losses following NH3 volatilization might be more relevant in volcanic soils than direct N2O losses. Ammonia (NH3) and nitrous oxide (N2O) are the most important gaseous losses generated by agriculture. Ammonia volatilization influence the formation of acid rain, acid particulate matter, and smelly odors (Luo et al. 2007), and is also indirectly linked to N2O and global warming (Erisman et al. 2007); N2O is a potent greenhouse gas (GHG) and contributes to the depletion of the ozone layer (IPCC, 2006). The use of urease (UI) and nitrification inhibitors (NI) has been tested worldwide in grasslands and crops, using fertilizers or organic amendments (e.g. animal manures) on soils, as mitigation option (e.g. Luo et al. 2010; Forrestal et al. 2016). While UI slow urea hydrolysis and reduce the accumulation and volatilization of NH3 (Tomar et al. 1985), NI inhibit the first stage of nitrification, the oxidation of NH4 + to NO2 - by action on the Nitrosomonas sp., which prolongs the NH4 + form in the soil and reduces N2O emissions and NO3 - leaching (e.g. Di and Cameron, 2006; Hatch et al. 2005). Studies by Rao and Puttanna (1987) showed that the use of NI can also lead to N loss through NH3 volatization. This suggests that the action of NI is conditioned by edapho-climatic factors. Of the UI globally studied, the most used is N-(n-butyl) thiophosphoric triamide (NBPT). Of the NI, dicyandiamide (DCD), has become the most widely used for its efficient inhibition of nitrification (Trenkel, 1997). However, various studies have indicated that DCD’s efficacy at reducing N loss from N2O emissions and NO3 - leaching is variable (e.g. Davies and Williams, 1995, Cahalan et al., 2010). Additionally, DCD has been shown to be strongly affected by soil type, which could be related to soil organic matter content and its microbiological activity (Cahalan et al. 2015). Soils of Southern Chile have high organic matter (OM) concentration (c.>10% to 50%), and recent studies have shown that NH3 volatilization would be the main pathway for N losses in these soils (Salazar et al. 2012a, 2014), with a low contribution of N2O (Vistoso et al. 2012; Hube et al. 2017), low N leaching (Salazar et al., 2012b), and also low nutrient losses following dairy slurry application (Huertas et al., 2016). However, there is little information on the use of nitrogen (N) inhibitors in Chilean volcanic grassland soils, and lack of studies with concurrent measurements of both gases, which would contribute to determine the ‘swapping effect’ occurring between them. The study aimed to evaluate simultaneous gaseous (NH3 and N2O) losses following the application of urea and dairy slurry, alone or in combination with N inhibitors in a volcanic grassland soil. Intact soil cores (0-15 cm) were collected in small PVC lysimeters for gas measurements (9.7 cm internal diameter, 20.0 cm height). The soil was collected at a grassland site from an Ultisols (Typic Hapludult, Soil Survey Staff, 2014), at San Juan de la Costa, Los Lagos Region, Southern Chile (39° S; 73° W), having a clay texture, more than 1 depth, 15.6% ± 0.82 OM concentration, water pH of 5.7 ± 0.03, and a bulk density of 0.9 ± 0.01 g cm-3. The soil had no N application in the year prior to the sampling. Five N treatments (equivalent rate to 100 kg total N ha-1) were tested: Urea, Urea+NBPT (N-(n-butyl) thiophosphoric triamide the source of NBPT was Agrotain, (Koch Agronomic Services, Wichita, Kansas, USA); Urea+DCD (Dicyandiamide, Alfa Aesar, USA); Dairy slurry; and Dairy slurry+DCD. Also, a Control (N-0) treatment was included. Fertilizer granules and dairy slurry were broadcast onto the grass surface and N inhibitors solutions were surface sprayed immediately after fertilizer granules or dairy slurry applications, at recommended rates (1.25 g Agrotain kg-1 N applied, and 10 kg DCD ha-1, respectively). Treatments were distributed on a randomized block design (n=4) and evaluated under controlled conditions (80% water field pore space-WFPS, 20°C) for 28 days. Soil moisture was maintained constant by gravimetric water balance adding deionized water over time, when required. Fresh dairy slurry was collected from the experimental farm at Remehue Research Centre (Osorno, Chile) for each experiment and separate samples of slurry for each replicate (n=4) were collected and chemically analyzed (Table 1). 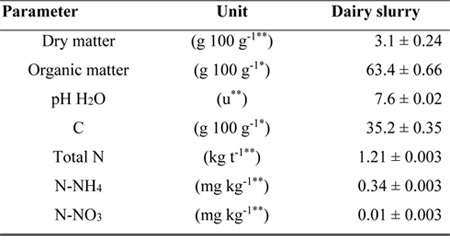 Table 1: General characteristics (± standard error of the mean) of dairy slurry used in the experiment (n=4). The dynamic chambers using for measuring NH3 were similar to those used in previous studies (e.g. Chadwick et al., 2001), incorporating a transparent PVC lid on the top of each to allow plants photosynthesis. This lid had two inlets and two outlets that were connected to a vacuum pump with a constant air flow of 4L min-1. These systems have the potential to over-estimate ammonia losses, nevertheless the system provides a good comparison of treatment/inhibitor effects. The air was scrubbed clean of NH3 by bubbling through 100mL of 0.02 M orthophosphoric acid, and then passed through a similar trap to capture NH3. The acid traps were changed at 6h and then every 24h for the first week, and every 2-3 days until day 28. Aliquots from the outlet NH3 traps were stored (3-4°C) until analyzed for ammonium using automated colorimetry (SKALAR, SA 4000, Breda, The Netherlands). Ammonia loss was calculated as the product of the total airflow and the difference between NH3 concentrations in the air leaving and entering the chamber. Nitrous oxide emissions were quantified using an adaptation of the closed static chamber technique (Saggar et al. 2004) setting up at the top of the lysimeters, when NH3 sampling was done. Air samples (30 mL) were taken at 0, 20 and 40 min of deployment in 22mL glass vials. Air samples were taken before the fertilizer addition and 1, 3, 5, 9, 14, 21 and 28 days afterward. The concentration of N2O in the gas samples was determined using a Gas Chromatograph (Perkin Elmer( Precisely, Clarus 600 Model, Shelton, USA) fitted with a 63Ni electron capture detector (ECD). The N2O fluxes were calculated using the equations described in Saggar et al. (2004). Indirect N2O emissions from NH3 volatilization were estimated as 1% of total N losses as NH3, as suggested by the methodology provided by the Intergovernmental Panel for Climate Change IPCC, 2006). Fluxes and cumulative NH3 and N2O emissions were analyzed by ANOVA using Genstat 12.2. Means comparison was made using a Least Significant Difference Test (LSD). Most of NH3 and N2O losses were concentrated in the first six days of the experiment. In this period, between 64% (Dairy slurry+DCD) to 92% (Urea) of N-NH3 losses, and between 31% (Urea) to 58% (Dairy slurry) of N-N2O losses occurred (Figure 1). Figure 1: Average N-NH3 (left axis) and N-N2O (right axis) emission rates per treatment (mg N m-2 h-1). Errors bars represent the standard error of the mean from four replications. Ammonia emission rates were greater, for all the treatments, than those observed for N2O, reaching up to 73.1 mg N N-NH3 m-2 h-1 with urea (P<0.01), and higher than those treated with dairy slurry. 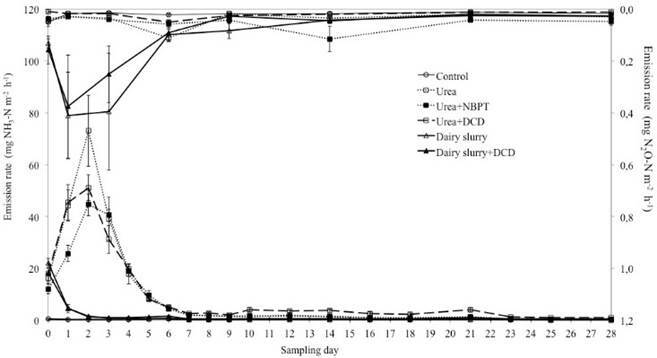 Fluxes of N2O were higher in the dairy slurry treatments, with and without DCD compared to urea and control treatments, where the highest emission rates were observed on the first five days following the application of Dairy slurry treatment (Figure 1). The pattern of ammonia emission was similar for slurry treatments, where high peaks were observed immediately after dairy slurry application and dropped quickly up to day two were emissions rates were similar to the control treatment. Urea treatments shows a different emission pattern compared to dairy slurry treatments, with low losses immediately following urea application to soil and with high rates from day one to six. Cumulative NH3 emissions after urea application varied from 3.5±0.25 to 4.3±0.25 g N-NH3 m-2, which was equivalent to c. 35% to 43% of the total N applied (with and without N inhibitors) being much higher than those observed for dairy slurry and control (N-0) treatments, respectively (P<0.01; Table 2). Cumulative N2O emissions were higher in the Dairy slurry treatment, with and without DCD (54.2±9.85 mg N-N2O m-2, on average; Table 2). The use of DCD reduced N2O emissions by 44% and 8% when used with Urea and Dairy slurry, respectively. The use of both inhibitors did not change the pattern of NH3 or N2O emissions in relation to the same treatment with no inhibitors addition (P>0.05; Figure 1). Table 2: Cumulative N gaseous losses (mg N m-2) (±standard error of the mean) and N-NH3/N-N2O losses ratio for data reported in the experiment (n=4). Volatilization of NH3 was the main pathway of N loss in this volcanic soil, in agreement with previous results (Salazar et al. 2014), with loss rates peaking within one to three days after dairy slurry or urea, respectively, for surface applications to grasslands (Figure 1). In addition, most of the N2O loss occurred within six days following application. Therefore, mitigation options for grasslands, especially for NH3, should be focusing in early periods after surface N application. Ammonia losses were much higher on urea treatments compared to the dairy slurry or control treatments. The low NH3 loss observed when using dairy slurry, based on total N, could be associated to its low N-NH3 content (25.7% ± 1.0% of the total N), which is common from grazing dairy systems (Salazar et al., 2007) and due the diluted composition of the dairy slurry, which can then rapidly infiltrate into the soil, reducing the potential for NH3 loss (Smith and Chambers, 1995). Additionally, the high soil moisture conditions prevalent during the experiment could have further reduced the potential for NH3 loss. The use of DCD reduced N2O emissions when used with Urea and Dairy slurry. This agrees with previous data from the use of DCD in grassland soils of New Zealand (Di and Cameron 2006; Saggar et al. 2009), although these studies results were higher than those reported after an autumn N fertilizer addition on an Andisol of Southern Chile (Vistoso et al. 2012). This was probably because the current experiment was carried out at 80% WFPS, providing anaerobic conditions beneficial for denitrification. Additionally, the efficacy of DCD has been shown to be affected by soil type (Cahalan et al. 2015) with higher degradation rates of DCD in soils with higher organic matter concentrations, such as that used in the current experiment (15.6% ± 0.86). Ammonia volatilization was 164 and six times greater than losses as N2O for Urea and Dairy slurry, respectively (Table 1). Moreover, NH3 has been recognized as N2O precursor (Erisman et al. 2007), so that in the current experiment indirect N2O emissions from NH3 volatilization estimated according to the Intergovernmental Panel for Climate Change (IPCC, 2006), varied between 4 and 43 mg N-N2O m-2, being equivalent to 6% (Dairy slurry) to 75% (Urea+DCD) of the total N-N2O emissions, considering both direct and estimated indirect N-N2O losses. These results suggest that indirect N2O losses following NH3 volatilization might be more relevant in volcanic soils than direct N2O losses. Field studies using micrometeorological integrated horizontal flux mass balance (Denmead et al. 1977) and the small wind tunnels methods (Lockyer 1984) on permanent grasslands in Southern Chile have shown that NH3 volatilization ranged from 1.4 to 26.7% of the N applied as urea, being the main pathway for N losses on grassland soils (Salazar et al. 2012a; Salazar et al. 2014), grazing systems (Nuñez et al. 2010), and from livestock production systems (Muñoz et al., 2016), probably contributing more to GHG emissions from grassland soils than direct N2O emissions. Studies in this area have also shown a low contribution of N losses by nitrate leaching (Salazar et al. 2012b) and N2O (Vistoso et al. 2012; Hube et al. 2017). The inhibitor DCD could be adopted as a mitigation option in soils to reduce N2O losses when using urea or dairy slurry in volcanic soils, in agreement with studies reported worldwide (e.g. Saggar et al. 2009). However, according to a meta-analysis carried out by Kim et al. (2012) nitrification inhibitors could have a variable effect on NH3 losses following urea application, with most studies reporting a significant increase on NH3 loss. The use of NBPT should be further evaluated, with no N loss reduction in this study but reported reductions of N losses between c. 60-80% when using urea+NBPT compared to urea in field studies carried out in the same area (Salazar et al. 2014) and in grasslands experiments in Ireland (Forrestal et al. 2016). Further evaluations should consider the analysis of NBPT soil degradation or inactivation in soils with high organic matter concentrations. Additionally, meta-analysis and field experiments indicate that the use of NBPT, although with a minor effect on emissions, could benefit nitrogen use efficiency in crops (Akiyama et al. 2010; Hube et al. 2017), that effect could have been missed under the controlled conditions and the short evaluation period of the current experiment. Ammonia volatilization was the main N loss, with 35 to 43% and 5% to 16% of the total and available N applied in the Urea and Dairy slurry treatments, with and without inhibitors, respectively. The use of DCD reduced N2O emissions by 44 and 8% when used with Urea and Dairy slurry, respectively. The use of NBPT did not significantly reduce NH3 losses or N2O emissions from urea treatments. Results on concurrent N gasses losses from soil, showed that indirect N2O losses following NH3 volatilization might be more relevant in volcanic soils than direct N2O losses. The simultaneous study of both gases provided a comprehensive analysis of N losses to air in a volcanic soil, including an assessment of the pollution swapping effect. Thus, indirect N2O losses following NH3 volatilization can be highly relevant to understand N fate in volcanic soils.